We haven’t looked at single knives in some time. Today we will change this by reviewing the Kershaw 1920 Select Fire Multi-Tool. Click here to buy the Kershaw 1920 Select Fire Multi-Tool on Amazon! Its design allows you to open the the knife using only one hand, which is a nice feature to have when you are holding something in one hand and need to open the knife in your other hand. This is something I’ve used to do by opening it by my mouth but as you can guess, the cold steel is not pleasent to have in your mouth. Closing is accomplished via liner locking mechanism. Basically, you have to push the flat bar at the blade opening to unlock the blade and close the knife. The foldable blade is 3 3/8 inches long and is made of 8CR13MoV stainless steel. It’s a capable material with good abrasion resisstance and edge stability. There are better steels out there like the VG10 or S30V, but this one is definitely not bad. Apart from the blade, the knife also features a bit driver. The bit driver is accompanied with 4 bits. If you are like me, you would lose the bits almost immediately. Fortunately, there is a bit holder built into the handle which can hold any standard 1/4 inch driver bits. The handle itself is made of glass-reinforced nylon and it sits rather comfortably in ones hand. The handle can also be used as a bottle opener. 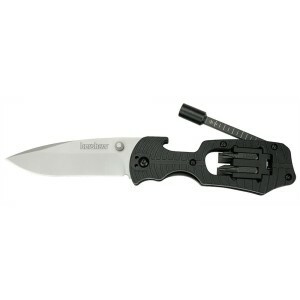 Overall, the Kershaw 1920 Select Fire knife is rated very highly by the customers. There were some complaints about the opening mechanism not working very well for people with shorter fingers. Nothing is perfect, but the positives outweight the negatives significantly for this knife. Especially the razor sharp blade and its ability to hold edge for a long time have been praised. The screwdriver has also been the target of the praising reviews. All in all, this is a very good utility knife, and if you are a knife geek, you should consider getting it. On the other hand, if you are looking for a more traditional knife, or a Swiss army type of knife, you should look elsewhere. The price of the knife is pleasantly low. This concludes our Kershaw 1920 review, hope you liked, and if you decide to get the blade, leave a comment how you liked it! Excellent inexpensively priced utility knife.